LeBron James' 46 points, 11 rebounds and nine assists Friday night carried the Cleveland Cavaliers to a 109-99 win over the Boston Celtics at Quicken Loans Arena in Cleveland, tying the Eastern Conference finals at 3-3. Game 7 of the series is Sunday night in Boston, with the winner meeting either Houston or Golden State in the NBA Finals. The Rockets take a 3-2 series lead into Game 6 of the Western Conference finals in Oakland on Saturday night. "Feels good just to be able to play for another game," James said after the game. "I've always said Game 7 is the best two hours in sports, so let's go have fun with it." 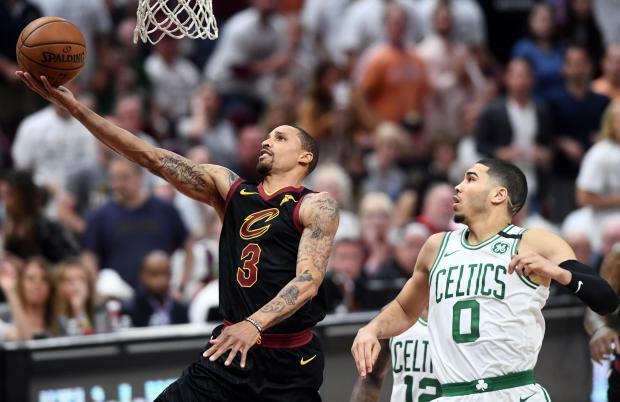 George Hill enjoyed his best game of the series for the Cavaliers with 20 points, while reserve Jeff Green chipped in 14 and Larry Nance Jr. hit for 10 points. They helped make up for the loss of forward Kevin Love, who lasted five minutes before leaving with a possible concussion after a collision with Celtics rookie Jayson Tatum. Love's status for Game 7 is uncertain. Terry Rozier pumped in six 3-pointers and led Boston with 28 points while Jaylen Brown gunned in 27. Tatum finished with 15 but was largely a non-entity during the first half. Reserves Marcus Morris and Marcus Smart scored 10 points each. "This troupe's resilient," Celtics coach Brad Stevens told reporters postgame. "We'll be ready to go on Sunday." Cleveland led for most of the last 2 1/2 quarters, although the Celtics made things interesting in the fourth quarter when they cut the deficit to seven on multiple occasions. But James drilled back-to-back 3-pointers in a 43-second span to up the lead to 107-96 and quash remaining suspense. "Does that ever come into our minds? Yeah, like every time we're out there," Stevens said of James' greatness. "Best player in the game, special night tonight. I can't say enough good things about him." The Cavaliers also dominated the glass and reaped the benefits at the foul line. Cleveland finished with a 44-31 advantage in rebounding, including 15-5 on the offensive boards, and went 18-of-22 at the stripe. Boston was a poor 11-of-20 at the line. The Celtics actually got off to a good start, unlike one-sided Game 3 and 4 losses in Cleveland. Brown lit it up with 15 first-quarter points, converting a pullup jumper with 8.3 seconds remaining that put Boston ahead 25-20. Things turned for good in the second quarter, when the Celtics could only manage 18 points. James' floater with 21.8 seconds remaining wrapped up a 25-point half and helped usher the Cavaliers into the locker room with a 54-43 advantage. "Been fortunate enough to play some good basketball through my career," James said. "Hopefully, I'll get myself in a position to play great once again on Sunday."